DALLAS: 2013 AHR EXPO (JANUARY 28, 2013) — The redesigned X-Plus UV fixture from UV Resources accommodates 17- to 61-inch extended base lamps, which easily mount from the exterior of any HVAC system, air handler, plenum or duct, making it a low-cost, reliable and quickly serviceable unit favored by contractors. Because the NEMA-rated unit mounts from the exterior and requires no interior unit access, the redesigned X-Plus extended UV-C lamp-base series is ideal for hard-to-access outdoor and indoor HVAC equipment up to 30 tons, including rooftop package units, through-the-wall, or fan coil units. Benefits from the new X-Plus include improved heat transfer, reduced energy use, lower odor and maintenance, reduced cleaning downtime and damage, and “sustained” capacity of an air conditioning system… while improving IAQ. The inexpensive single-ended fixture accommodates lamps up to 61-inches in length and offers important safety features that include a lockable access cover, two power interlocks that limit UV exposure and prevent electrical shock, and a shatter-proof lamp option. Suitable for new systems and as a retrofit product, the rugged and extremely adaptable X-Plus fixture can be easily installed in most light-commercial, commercial, industrial, healthcare and high-security applications. Designed to maximize lamp strength, UV and heat resistance, the X-Plus extended base lamps are constructed using a 2-inch ceramic base fitted with a longer-reach filament, allowing the lamp — and, most importantly, the new filament — to extend beyond the air handler’s insulation or a double-wall plenum and into the airstream for improved lamp performance and life. This is important because improper placement of the filament — within insulation and/or plenum wall materials — can allow heat to reflect back on the filament, raising its temperature to levels that are detrimental to lamp performance and operational life. Introduced in 2008, the original X-Plus fixture enjoyed vast popularity for its low weight, low-cost, installation ease, versatility and reliability, enabling contractors and building owners to incorporate the benefits of UV-C technology almost anywhere it was needed. Ideal for a full-range of applications including airstreams of 1 to 77 degrees C, 100-percent RH, and any velocity, the NEMA 4X-rated fixtures and lamps resist moisture/water damage. The exclusive EncapsuLamp (FEP lamp coating) technology option insulates lamps from temperature changes, which can negatively affect lamp output, life and performance, as well as protecting installers, plenums and airstreams from lamp residues, such as gas, mercury and glass, should an accidental lamp break occur. The UV-C wavelength is known to reliably provide cleaner, healthier air by preventing microbial buildup in cooling coils, drain pans and duct surfaces. It cleans coils, drain pans and other surfaces and also kills pathogens on surfaces and in airstreams. The new, patent-pending X-Plus fixture builds on these benefits with an updated UL/CUL listed ballast for more power and flexibility, a ballast pull-ring to simplify lamp/ballast removal, and a lamp support to allow use of much longer lamps. The improved version nearly doubles lamp-length compatibility from 33-inches to 61-inches, and its new ballast provides greater voltage flexibility from 120V to 208/230/240V and 277Vac, or anything in between. The new ballast automatically matches both its output voltage and current to the unique power requirements of a particular lamp’s ratings. Also announced are four, new, extended-base lamp lengths of 23-, 36-, 45- and 60-inches. The new lamp base delivers additional support and an extended reach to perfectly clear double-wall systems, regardless of size. The new lamps contain less than 8 milligrams of mercury, consistent with current environmental practices. 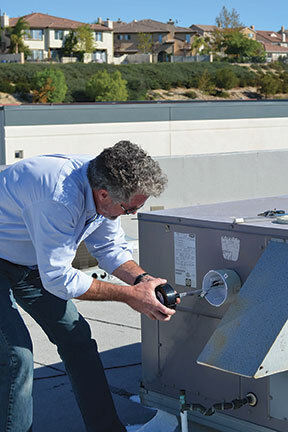 “Besides disinfecting air streams, UV-C offers significant operational benefits, including keeping HVAC coils, drain pans, and other internal surfaces free of microbes, organic dirt and grime — materials that produce odor, reduce airflow and cooling capacity,” adds Jones. The redesigned X-Plus UV fixture from UV Resources now holds lamps up to 61-inches. Its new extended base lamps are central to ease and function in exterior mounted fixturing for HVAC systems, air handlers, plenums or ducts. The exterior mount, NEMA-rated fixture is ideal for hard-to-access outdoor and indoor HVAC equipment, thereby expanding the number of surface and airstream applications that will benefit from UV-C light. Suitable for new and retrofit systems, this rugged and extremely adaptable X-Plus fixture is favored by contractors for its low-cost, reliability, and ease of service/maintenance. For more information, call 877-UV4-HVAC (884-4822); or visit www.UVResources.com. UV Resources (UVR) is a leader in the education, design and innovative engineering of ultraviolet-C equipment for a variety of commercial, healthcare, government and residential HVACR applications. In addition to developing new and unique UV products for specific applications, UVR team members were among the first to develop modern sizing and efficacy software for air conveyance systems and regularly consult with both OEM and government-sponsored, UV-related entities. UVR is an active member of ASHRAE, Illuminating Engineering Society (IES) and the International Ultraviolet Association (IUVA). For more information, call 877-UV4-HVAC (884-4822); or visit www.UVResources.com. X-Plus™, EncapsuLamp™ and LampClamp™ are trademarks of UV Resources.